Below is an invitation I set up for my 7 Month old. 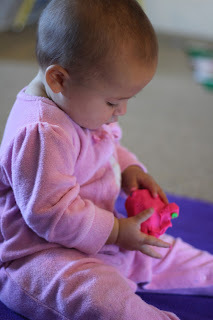 She loves any sort of sensory play and I wanted to bring in another medium. I had no idea how she was going to react to this and boy was I in for a surprise. I always say this, and I will say it again... NEVER underestimate your children. This invitation was set up for her right after breakfast with a full belly of yummy food and milk. Yes, you may put that in your mouth. Yeah... that didn't taste so good. She LOVED the little tiny pieces that had broken off. "You are holding the green play dough. You are squeezing it! That must feel squishy in your hands. Uh oh, it's stuck on your finger. That is so silly! There it goes. The dough fell out of your hand. Where did it go? There it is... you found it!" I ended up rolling some smaller pieces into balls since she really enjoyed the smaller pieces. The dough would often get stuck on her hands. So fun to watch her problem solve to get it off. She probably could have played with this all day. Below is a short 4 minute video of her play in action. Thank you! THis is a precious snippet that holds soooo much meaning. What moves me most is the pure TRUST between you and your child. Again, thank you. I want to play this on every computer at work on repeat to spread the word about viewing our children - even BABIES (gasp) as full, capable, competent humans capable of making connections and making meaning, even on their own. Love LOVE your work mama. LOVE the mirror as part of the play invitation. Great for her exploration and, purely from a practical standpoint, great for photography.